Last week you visually explained what you do as course designers. This week, it’s time to show what you’ve done as course designers. How do you show your work? In a portfolio, of course. But this time, use your same tools for building learning projects and let your creativity run free. Seriously! It’s your time to showcase your skills with the tools you use every day. I get it. Most course designers don’t like to think about portfolios. Saying “look at what I did” probably isn’t in your DNA. But portfolios are a lot like flossing teeth. You never really know how important it is until it’s too late. Last month I posted a forum thread asking users to share their e-learning portfolios. Some folks had their portfolios ready, others had to scramble. This week, Jackie Van Nice shared some creative resume ideas and asked the community if anyone had built their portfolios or resumes using Storyline. Some lively discussions followed around topics like: when to use interactive resumes, what will recruiters think, and what types of jobs are best suited for non-standard resumes. An interactive portfolio should move beyond the paper resume. It’s your opportunity to create excitement and lengthen the time recruiters view your e-learning portfolio. Your interactive resume can be courses, excerpts from courses, screenshots, word docs, screencasts, or anything else you want to feature. As always, you can share your examples in the comments below as well as on your own blog. Need someone to help upload your files? I’m happy to host your files for you on Articulate’s servers. Bonus: Take the challenge up a notch by sharing a template version of your interactive resume that others can use. I’ll create a new blog post to highlight the templates and promote everyone who shares. You can use Articulate Storyline, Articulate Studio, or PowerPoint to build your interactive resume. To help you get started, check out some of the websites your fellow community members built using Articulate software. Jeff Kortenbosch kicked off this week’s challenge by sharing what people think corporate e-learning specialists do. 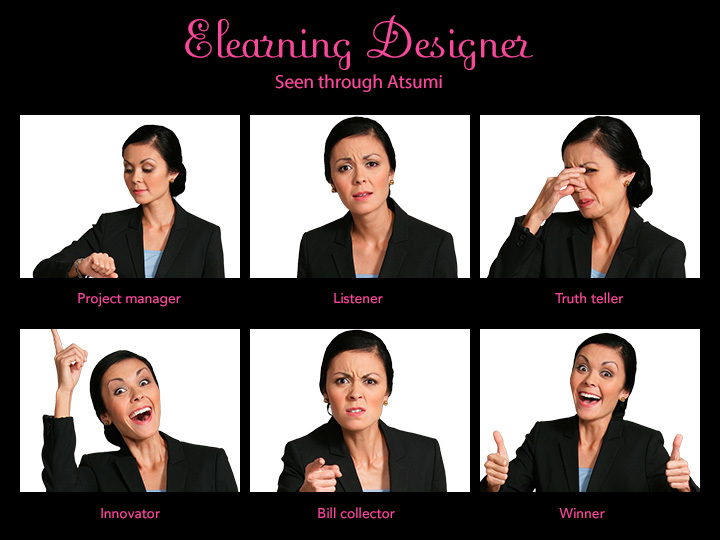 Montse Anderson shared her thoughts on what people think of e-learning designers, and what everyone’s favorite e-learning character thinks about e-learning designers. Joshua Roberts may be the only one in his circle who knows what an e-learning designer does. Rebecca Fleisch Cordeiro built a creative interaction to explain what she does as an instructional designer. Becky later shared her .story file so everyone can check out the cool menu she used. Thanks, Becky! Ashley Chiasson spends a lot of time juggling tasks and drinking coffee to keep up her amazing instructional design skills. Shefali Godinho joined the community with an insightful poster explaining how she chooses books at the library. Welcome to E-Learning Heroes, Sefali! Miranda Verswijvelen took things in another direction in this interactive explainer on how others view her home country, Belgium. Bruce Graham jumped into the challenge to explain what he really does with a video-based explainer. Spoiler alert: Story Lion makes an appearance. Jackie Van Nice shared a hand-drawn interaction to disabuse others of the idea that e-learning designers are a sketchy lot. Well done, Jackie! Michael Hinze isn’t your typical super star course designer, but that doesn’t mean he doesn’t experience the typical e-learning problems from time to time. 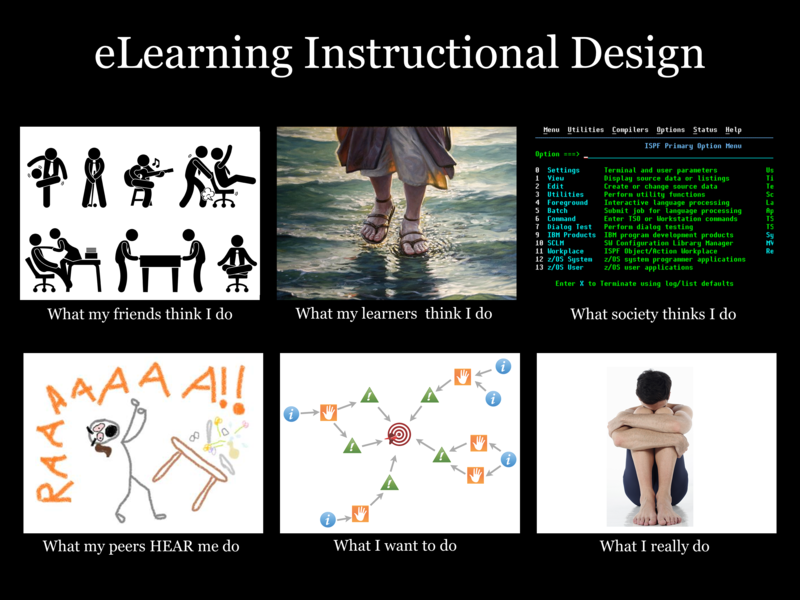 Abram Siegel shared a creative look at what he and others think e-learning instructional designers really do. Nice one, Abram! Allison Nederveld shared a related video that humorously captures the challenges creatives have fitting into the corporate world. Thanks for the laughs, Allison! Rachel Barnum explains the multifaceted world of what educational technologists do in this thoughtful meme poster. Nicola Redfearn joined her first challenge (Welcome, Nicola!) 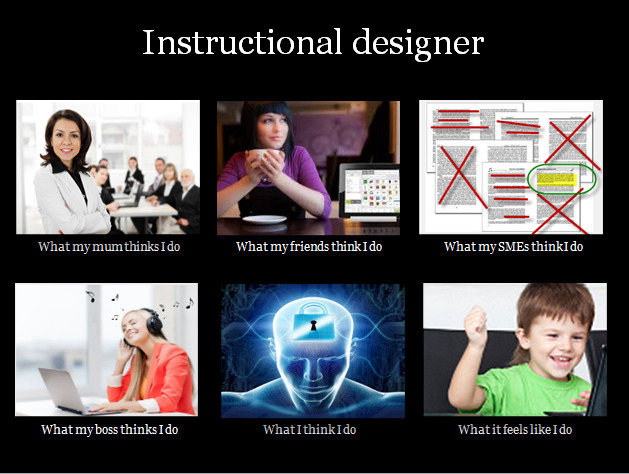 to explain what everyone from her mum to her boss thinks instructional designers do. Nicely done, Nicola! Ashley Kontos shared her first challenge entry with a creative explainer of what her clients and family thinks she does as an instructional designer. Nice job, Ashley! Dan Sweigert explains who he is and what others think he does as an e-learning designer. Sjoerd de Vries is serious about explaining what e-learning designers do, even when he uses Comic Sans and character voices that are anything but serious. Great demo, Sjoerd! 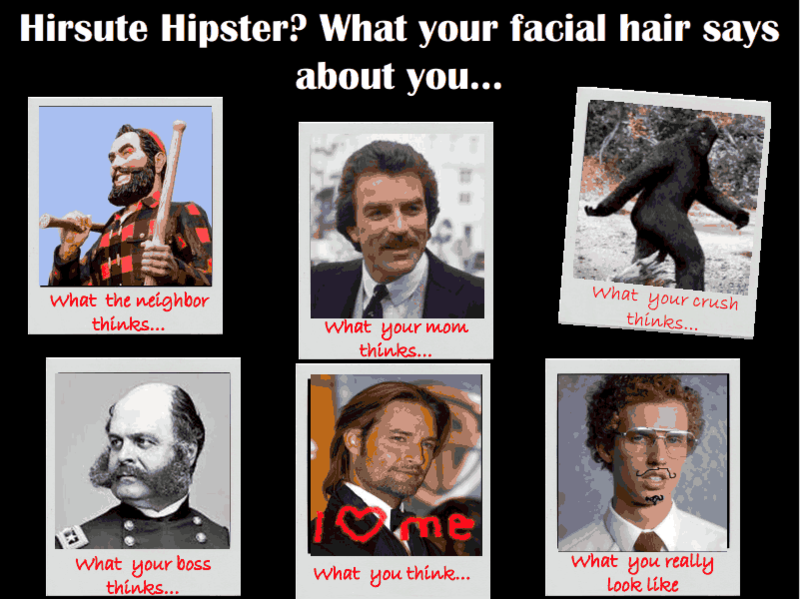 Mary Cropp shaved off some common misconceptions to explain what your facial hair really says about you. Awesome, Mary! Patrick Gurczynski scored a three-pointer with his explanation of what others think of his world. Nice one, Patrick! Nick Russell sketched out his explanation of what those around him think he does in this animated explainer. Gemma Henderson didn’t let computer problems prevent her from sharing what e-learning designers do in this vintage-themed explainer. Great demo, Gemma! 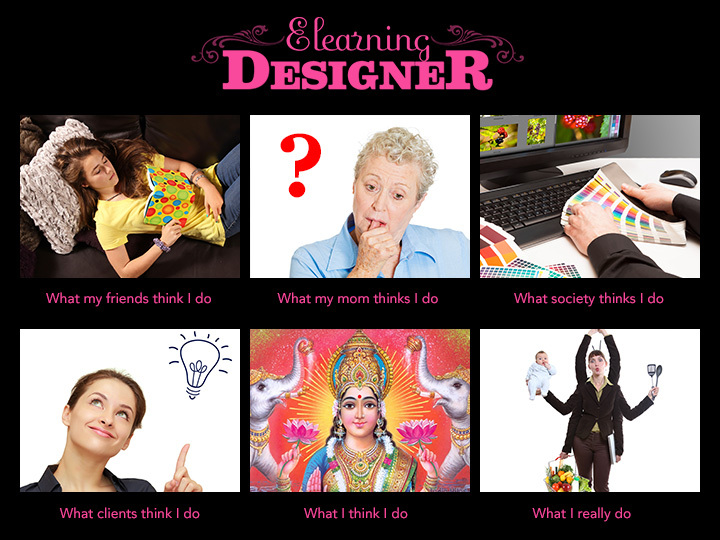 Kimberly Bourque went meta with the challenge by calling on some popular memes to tell us what she things e-learning course designers do. Love it! 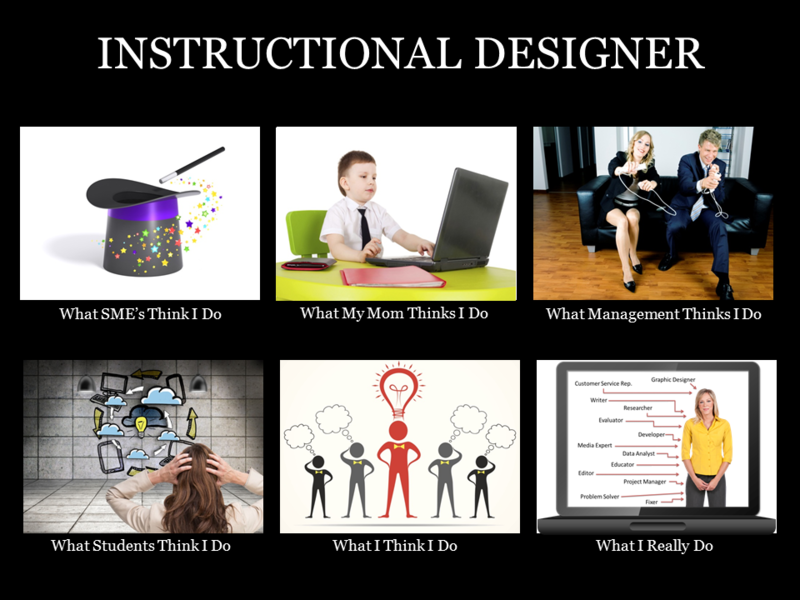 Jan Gillies shared some really fun panels depicting what those around her think instructional designers really do. Paul Alders created custom characters to share what his family and friends think e-learning developers really do. Tracy Parish went with a cartoon design theme to tell her story of what e-learning designers do. Ian McConnell reminded us that job titles only describe a portion of what e-learning developers really do. Check out Ian's blog post for even more insights into how this creative poster came together. Thanks, Ian! Richard Watson shared a fun interaction that combines animation, illustrations, and a touch of humor to communicate what those around him think e-learning designers really do. Great project, Richard! Wishing you a showcase week, E-Learning Heroes! Ok, I'll try this message again...Thanks for covering this topic! I've been turning this idea over in my head for a while now, but haven't pulled the trigger to do it. It will be very exciting to see what fellow designers do and if any of them have to address privacy restriction and regulation with their designs. Hi Patrick! I'm getting a 404 error when I follow your resume link. Weird. I was having some DNS issues last night, but I thought they were resolved. I'm sorry, I'll see if I can figure it out. @ Patrick: So well done. Any chance you'd be willing to share the .story file (even a stripped down version)? One thing I seem to struggle with is getting the timing right on having things enter and exit to create movement. Tim Slade's work has been really helpful/inspiring and it looks like your example would be too. If you prefer not to I totally understand. Regardless, thank you for posting. Love it Patrick! I can definitely feel the sports vibe in the audio! I've been meaning to do this for a while, this will finally give me the push to do it! Expect my entry early next week! Great job with your portfolio design, Patrick. Really dig the motion graphics! Welcome to E-Learning Heroes, Lindsey! I really like what put together. You may be new to elearning, but you clearly have a good feel for color and layout design. I think it looks great! 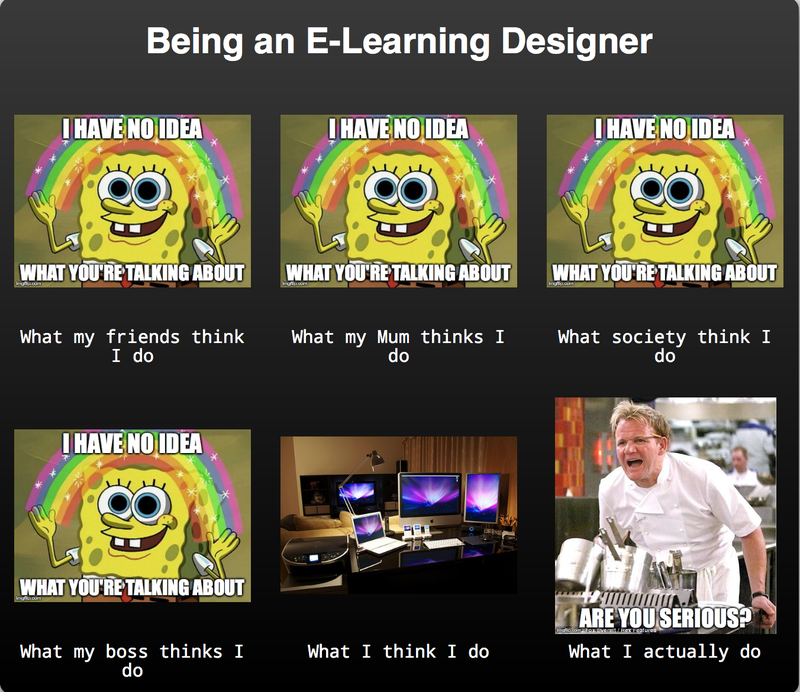 I think it's also really cool that news designers like you and Patrick are excited about elearning. There's a lot we can learn from each other. Thanks again for jumping into the challenges! And a big Thx! to Patrick for introducing you to the community challenges. Great portfolios Patrick and Lindsey. Loved the layout design for yours Lindsey. Here's mine: http://cropcirclecollective.com/dan_sweigert_portfolio/story.html Now, it's time for me to see what everyone else has done so far. Wow Patrick, I can tell you've spent a lot of time refining this. I love all the animations flying in and out which really fit the mood of the music. And the choice of colors works very well with what you're doing. I also see we both have a bit of a journalism background although my experience was more with arts and entertainment. Thanks for the kind words everybody. You guys are awesome! Lindsey and I can't believe how supportive and encouraging this community is (especially after coming from newspapers). Your work is so inspiring! @Adena: Send me your email address, and I'll send you a copy of the Storyline file. It gets a little confusing because it's all built on one slide. I didn't know how to span audio across multiple slides when I started, so I had to create everything on one slide but across several layers. Hi everyone, Patrick, Lindsey and Dan thanks for sharing your examples, there's some really great ideas on display! A portfolio work is something that I need to put together so I'm looking forward to this weeks challenge. I was thinking that I might go back and do some of the old weekly challenges in order to have some examples to show. Lindsey and Patrick - welcome to the 'club'! I really hope to see more of you of your work in the future challenges. Great work! Lindsey - the interaction and use of Storylines scrolling panel worked out very well in your entry! Patrick - I really like your animations and consistency of colors! Dan - You probably put a lot of effort in this one. You nailed it again! I especially like your idea of deviding your samples into separate topics! Great work. 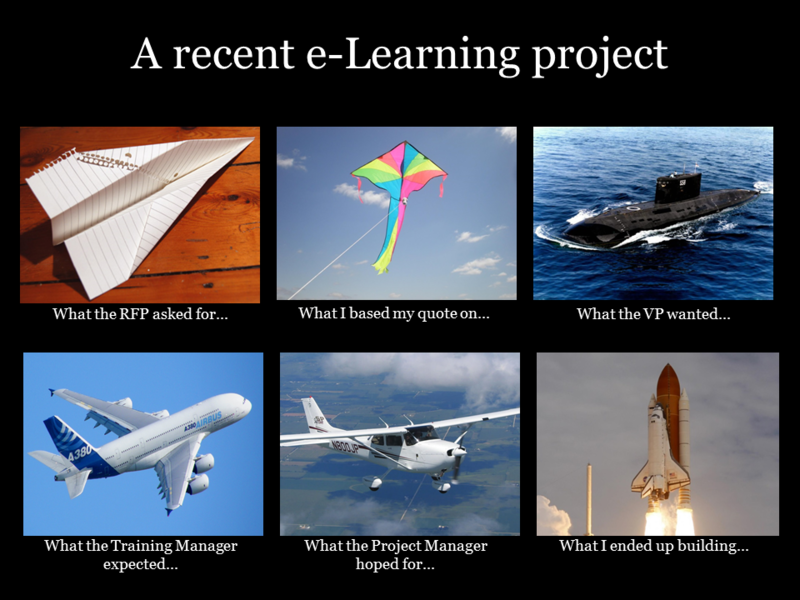 Last week I was approached for another engaging eLearning project. Because the organization has asked me to deliver a portfolio this challenge comes at the right time for me! Thanks for the good words Paul and best of luck on the proposal for the new project! Dianne--great concept with a fun design! Don't forget to add in ways to get back to the main menu. I keep getting stuck once I've clicked on an image. I just wrote and recorded a little James Bond-type tune for Jackie Van Nice's upcoming submission. It took 15 tracks on Cubase SX recording software. I can't wait till you guys get to hear and see it.